BRIG Prictor said Tiger has been the most complex piece of equipment the Army has ever introduced. 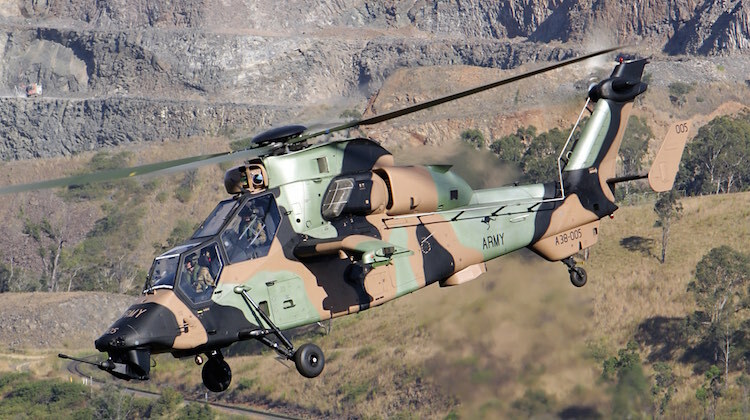 In late February the federal government’s Defence White Paper and its accompanying Integrated Investment Program outlined plans for the Tiger’s earlier than expected retirement. “The Tiger has had a troubled history – essential upgrades are programmed to maintain the capability’s effectiveness,” the Integrated Investment Program document stated. In the meantime, “It will be an operational aircraft for at least the next 10 years until any replacement and we will continue to make it the best possible weapon system we can,” Airbus Group Australia Pacific managing director Tony Fraser said in welcoming the FOC attainment. Fraser is himself a former Commander 16 Aviation Brigade and later was Head Helicopter Systems Division within the then Defence Materiel Organisation where he oversaw the Tiger’s introduction into service. 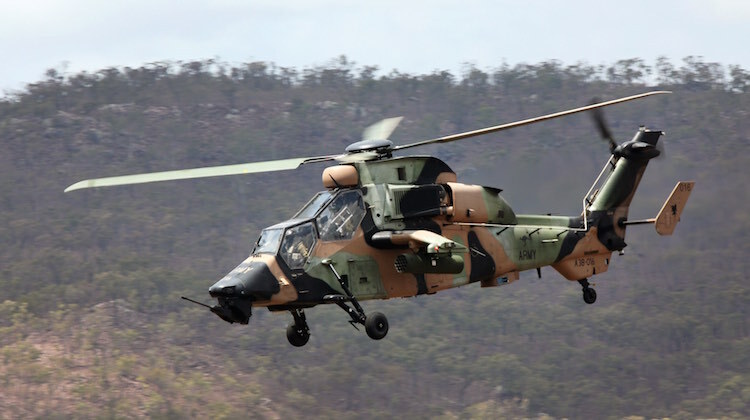 He acknowledges the Tiger ARH has had its delays but says Airbus Helicopters “will stay focused on making sure Tiger ARH is ready to go to war”. Further capability expansion for the Tiger will get underway in June, when it will conduct flightdeck handling trials on the Navy LHD amphibious assault ship HMAS Adelaide while alongside in Brisbane. LHD first of class flight trials will then be conducted in early 2017. “There is a lot of work to be done to get Tiger on to the LHDs,” said BRIG Prictor. “It is a much more complex feat because we have to make sure we safely handle its Hellfire missiles, 70mm rockets and gun rounds while on board, something that you wouldn’t normally have to worry about with our other helicopter types on the LHDs. “Tiger is not just a helicopter, it is a complex instrument with three precision weapon systems on it with a suite of sensors and electronic warfare self protection systems which all had to be integrated into a machine that flies,” he said. If we have FOC and all the issues have been resolved, then why not keep the Tigers and if anything order another squadron or two? The above would be a formidable air group in anyones language. The whitepaper is a high level document so there is potential for plans to change. The White Paper could fly out the door the moment if and when Bill Shorten is sworn in as PM,after that it’s all up in the air. Will he stick by the current DWP, write his own or go back to Gillards?. If we have a couple of terms of Labor government than i suspect there will be no Tiger replacement. Eight Defence Ministers and Five prime Ministers. I wonder who is going to claim the credit? FOC for Tigers took 11 years. When are the F-35s going to reach FOC? Steve the final F-35 is not due in Australia to about 2023 so sometime after that and by then we may be close to a decision on the replacement for the Super Hornets, most likely more F-35As. In 1997, Lockheed Martin was selected as one of two companies to participate in the Joint Strike Fighter concept demonstration phase. In October 2001, the Lockheed Martin X-35 was chosen as the winner of the competition and teamed with Northrop Grumman and BAE Systems to begin production. Come 2023 not such a new aircraft and the concept /reason for having it will be 26 years old. How many out there are using a 26 year old computer. F-35 FOC is more likely to be around 2024 once all 72 aircraft have been delivered and supporting basing and other facilities are in place. I doubt we’ll see Tiger leave service until 2030 or after as there will be an overlap while the replacement capability is in development and workup. If and when Labor gets in, we shall see another razor taken to defence spending, including cutting the Collins class replacements from 12 to who knows what. Remember last time they were in power. Goeber – it was Labor who first stated we should get 12 subs in PM Rudd’s first White Paper. Both parties have been in step on Defence and security issues in recent years, so your call is a big and largely unfounded one. Jason – I agree it was Rudd that stated we needed 12 submarines, and that was as far as it got. All Gillard and her lap dog Steven Smith did was reduce the defence spend. Only the Liberals have increased money into defence, while for Labor it becomes the first department to pull funding.